This post has been years in the making… To make a long story short, I was on Partner track at one of the top consulting firms in the world and pivoted to starting my social media consulting practice and technology website (TechMamas.com). At the time I left that consulting firm, I already had one son, twin boys on the way and viewed starting my own business as temporary. My strategy of pivoting to running my own business was to have a more flexible career and then to pivot back into full-time work. At the time, I did not understand all the career options available and thought this was my only option. Little did I know how hard it would be to re-enter the workplace. I tried it on my own, hired some career consultants but really what I needed was an “in real life” program with other women also entering the workforce that offers training, networking and even a job board. 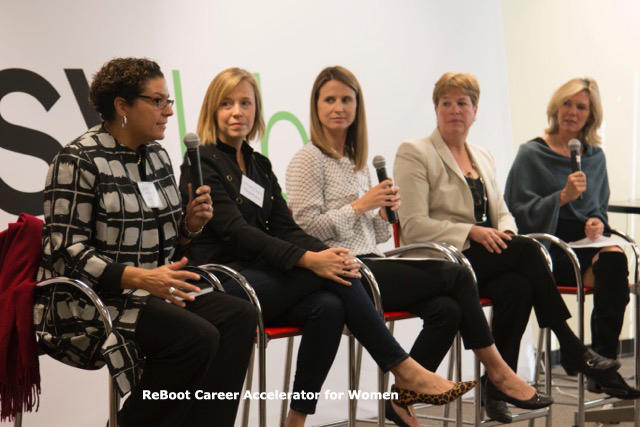 ENTER REBOOT CAREER ACCELERATOR FOR WOMEN! I had heard through multiple women in my business network of Reboot Career Accelerator for Women, but at the time was already interviewing for jobs. I ended up joining a new start-up called Savitude, the first marketplace for the working woman (which is all women!). Savitude is in the early stages, so I will look forward to sharing information about our mission soon! Luckily, through one of my Savitude meetings I had the delight of re-connecting with Beth Kawasaki who filled me in all of the fantastic details about the ReBoot Career Accelerator for Women. I was so excited about their program that I wanted to share details with my readers and business network. This is the type of program that I had been looking for and would have been really helpful for me when I started my career reboot. 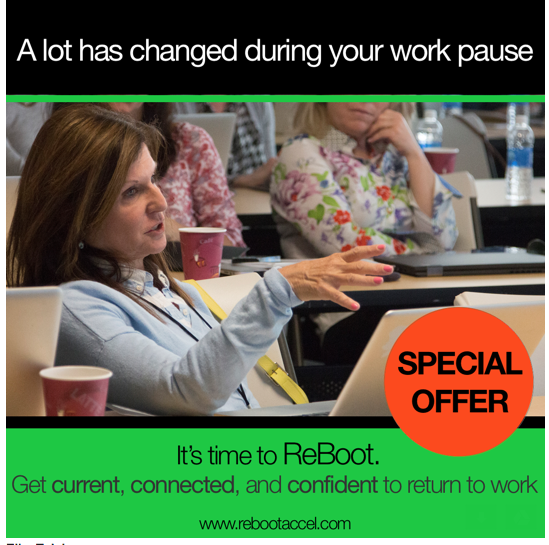 Beth and the ReBoot team answered some of my interview questions and shared a great offer for the TechMamas.com community! Early Bird Immersion Accelerator pricing of $995 (a $300 savings) ends February 1. ReBoot will extend those savings to Tech Mama followers through February 15. In addition, if your folks sign up for the Immersion Accelerator (2/29-3/3), ReBoot will offer them 3 months free of Club ReBoot (March-May). They are currently based out of based out of GSVlabs in Silicon Valley, California: GSVlabs, 425 Broadway Street, Redwood City, CA 94063. How were you and the team inspired to start ReBoot? The Co-Founder of ReBoot Career Accelerator for Women (ReBoot), Diane Flynn, was the first to reboot after a 10-year pause to raise kids, lead in schools and non-profits, and consult in healthcare. She returned to work at GSVlabs as CMO, initially part-time and soon full-time as increased business demands matched her enjoyment. Patty White (soon to be Co-Founder), mom of four kids and approaching an emptier nest, was intrigued and asked Diane to coffee. Patty was soon trying on a return to work scenario by volunteering to mentor start-up companies at GSVlabs. Based on their re-entry experiences and near mom networks, Patty and Diane observed that there is a large and largely untapped talent pool of highly educated and professionally experienced women who have paused significant careers, and now want and need to return to the paid workforce. BUT feel out of date and don’t know where to start. These incredibly talented women were and are the inspiration for ReBoot. On February 26, 2015, Diane and Patty invited 4 other women to discuss this trend, opportunity, and what a program might look like to get women successfully back into the work force after a work pause. Six weeks later (April 14) the Founding Committee* launched the first ReBoot Accelerator with a cohort of fifty women. Sixty more women went through the second Accelerator program last fall. 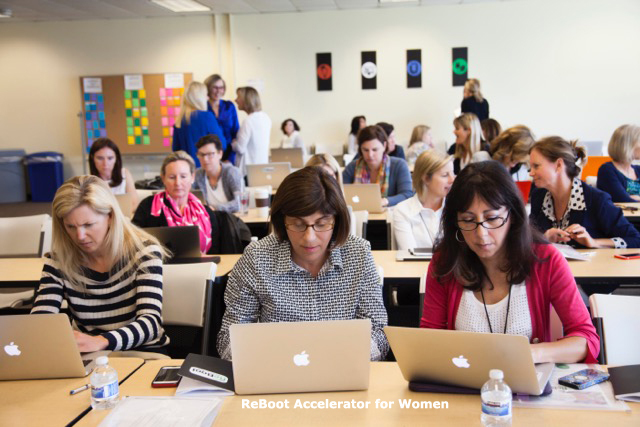 ReBoot will offer four Career Accelerators in Silicon Valley and one in Chicago in 2016. ReBoot helps women update their workplace and job search tech skills, reignite and expand their professional networks, and re-build career confidence so they can achieve next stage goals. What are the Profiles of those who would benefit from ReBoot? Women who are returning to work after a work pause, currently working but pivoting into another sector or function, and those still discerning next steps but want to get current, connected, and confident while evaluating their options. What are the different ways women can participate in the ReBoot Program and what is the pricing? The foundation of ReBoot is the Career Accelerator program. In this program, women learn the tech skills employees need Day One to be relevant and successful during a job search and in the workplace. ReBoot curriculum is taught by subject experts from LinkedIn, Google, Evernote, Apple, and Enjoy.com in addition to Silicon Valley luminaries like Guy Kawasaki. Women learn in a supportive community environment and apply new skills immediately through hands-on training exercises. We have a four day Immersion Accelerator February 29-March 3, and an eight week Accelerator (9AM-Noon/W’s) starting April 6. Same curriculum, different formats, $1295 regular price. Club ReBoot is our continuing education program focused on additional job search skills and on-going professional development. Members pay $20/month, auto-renewal, to have access to a minimum of three workshops a month including topics like “Rev Your Resume & Cover Letter,” “Prepare to Interview & Negotiate Your Salary,” and “Step up Your Marketing through Social Media”. In addition, ReBoot has a growing and active alumnae that enjoy workshops and quarterly evening networking events such as “ReBoot Success Stories” panels, and “Using Wine as a Business Tool” seminars taught my Sharon Harris, owner of Rarecat winery. Everyone is welcome to join Club ReBoot. In response to the many women currently in the discernment process, ReBoot is offering a special seminar “Clarify your Purpose and Passion” on February 28 and April 4 with Career Strategist Jennifer McClanahan-Flint. This content and timing complement the two upcoming Accelerators which start soon after each P&P seminar session and is $195. Disclosure: This is a press post offering value to my community! Heard about this & was excited to finally find some support. Such a great concept – but your prices are ridiculously high for many, including myself. I stayed home to raise my daughter (born when I was 38) & that 18-yr workplace lapse has rendered me considerable for only sales jobs (low paid so far) or beginner, starting positions for $7.15/hr (NC min. wage). After yrs of being labeled due to the work lapse & ageism – I am broke. I’m sure many women are in the same position. So how is your organization helpful when many can’t pay the ridiculously high fees for your services? You promote your services as noble – they are not. As far as I can tell, it’s all about money – for you. So please drop the noble act at least.